A Uyghur businessman suspected by Chinese authorities of maintaining contacts with separatist organizations has died under police questioning in China’s northwestern region of Xinjiang, Uyghur sources say. Abdurishit Haji, 55, was taken into custody on Dec. 16, 2016, and died on Jan. 13, with his body returned to his family that same day, his son Hesenjan Abdurishit told RFA’s Uyghur Service. Abdurishit Haji had worked in Kyrgyzstan about five years before, and had gone to Turkey two years ago to seek repayment of a loan, his son said. He had been living in Atush city in Xinjiang’s Kizilsu Kirghiz Autonomous Prefecture for the last year, he said. Abdurishit Haji had been accused by Chinese police of recruiting and fundraising for Uyghur separatist organizations while traveling on business in Kyrygyzstan and Turkey, Litip Imin—Communist Party secretary for Atush city’s Azak village—told RFA’s Uyghur Service. “He used to conduct a business in fabrics in Kyrgyzstan, but I don’t know what kind of business he did in Turkey,” he said. “I was the first person who was informed about Abdurishit Haji’s death,” said Litip, who was told by authorities to accompany Abdurishit’s family to the Ulugqat county hospital to take charge of the body. Friends and other community members came to the family home next day to express their condolences, but the house had been put under police watch, Litip said. 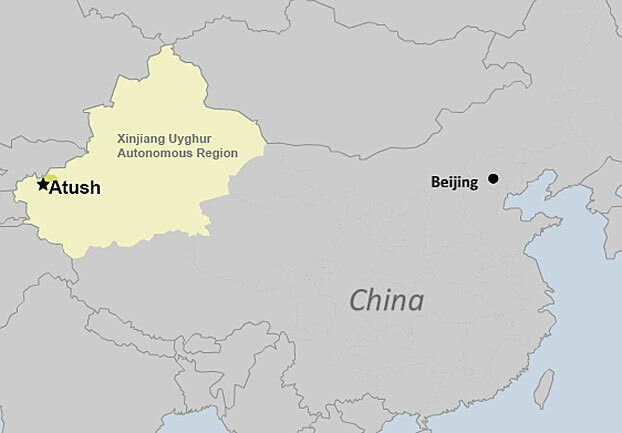 China has vowed to crack down on ethnic separatism in Xinjiang, the homeland of the Uyghur people, and regularly conducts “strike hard” campaigns including police raids on Uyghur households, restrictions on Islamic practices, and curbs on Uyghur language and culture. Reported by Jilil Kashgary and Shohret Hoshur for RFA’s Uyghur Service. Translated by Mamatjan Juma. Written in English by Richard Finney.